The project’s basic premise is to set an acoustic album that describes our musical journey as Guitarists and Composers, now as a duo. The main idea of this recording is to put together a set of nylon guitar styles that covers music from South America, Central America, Spain and Middle Eastern. We have included some ethnic rhythms like “Chacarera” from Argentina/Chile, “Partido Alto” and “Samba do Rancho” from Brazil, “Bolero” and “Salsa” from Central America as well as “Rumba Flamenca” from Spain, “Gipsy Jazz” and some Middle Eastern rhythms, all fusioned with a twist of Jazz. As a result of our different influences as musicians is that finally our album has ended as a beautiful world music guitar project. We had the fortune to count with some of the best musicians of Los Angeles as well as some of the best instrumentists worldwide. 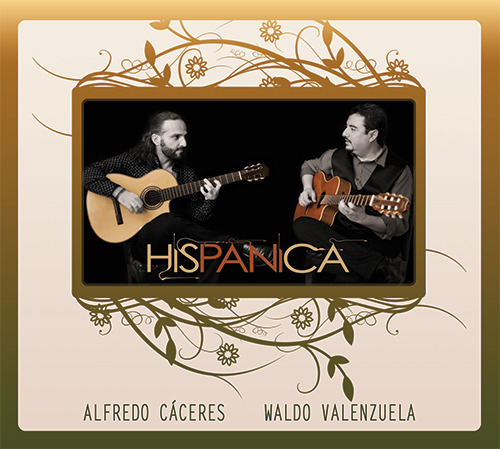 We are so proud to present HISPANICA, a humble rendition to our main engine in life….Music. Arturo “Turra” Medina (Chile) Songs written & arranged by Alfredo Cáceres & Waldo Valenzuela except for Rio McBoggie Part II composed by Alfredo Cáceres, Johny Sandoval and Jim McMillen. All songs recorded and mixed at Waldoval Studios for Waldoval Entertainment by Waldo Valenzuela (Van Nuys, CA). Tracks 7 & 11 mixed by Arturo “Turra” Medina at Turramusic Studio (Los Angeles,CA). Tracks 3 & 10 mixed by Sal Ojeda (Pasadena,CA). Drums on tracks 3 & 10 recorded by Sal Ojeda. (Pasadena,CA). Drums on track 11 recorded by Carlos Flood at Groove Gallery (Burbank,CA). Hand Percussion on tracks 2 & 11 recorded by Arturo "Turra" Medina at Turramusic Studio (Los Angeles, CA). Vocals on tracks 5 & 7 recorded by Georges Reyes (Tarascon, France). Mastered by Gonzalo Ramos at Studios Mix (Almeria, Spain). 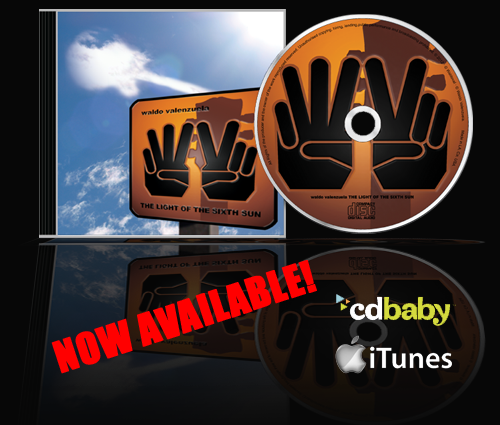 "If you are a fan of jazz-fusion, you will not be disappointed with this album. The sounds were all excellently recorded, and the parts were all masterfully played. The rhythms he imbues the compositions with reflect his Latin-American heritage,..."
"Brilliant breaks, drops, and solos placed at appropriate spots throughout the selections by Valenzuela and his accomplices make for a pleasant and distinctive listening experience..."
This album was recorded between October of 2010 and December of 2011. Studio 4, using a Euphonix CS-3000 console and GML 8304 preamps straight to Avid HD4 Protools System. All the other overdubs where done in Van Nuys, at Waldoval Studios using a Steinberg Sytem with Mytek converters. ...go to image gallery on Facebook. Big Brown Door is a musical project created in Los Angeles, CA which is born from the need to express the thoughts and music of Waldo Valenzuela (www.waldoval.com) and JB Boatman. Due to the diverse musical background between the two they find themselves diverging into the realm of Blues music which is influenced by Californian Rock as well as Pop and Soul. Welcome to this musical experience which fuses the best musicians that L.A. has to offer and has finally been brought to light this year, 2011.